Gloria Bullock grew up on West 151st street in Harlem along with her younger sister Joyce. They lived in a $34 a month apartment with their Mother, Sarah, who had moved to New York City from her native Roanoke, Virginia. The building, on the corner of Eighth Avenue was immediately adjacent to the Elevated station with its clattering trains. It housed more than its share of petty criminals over the years but also, during the mid to late 1940s, was home to noted jazz pianist and composer, Willie (the lion) Smith. Bullock had a talent for mathematics and was awarded the Mayor's Committee Scholarship to Hunter College. She also had an outgoing personality and was elected president of her 1950 graduating class. Shortly after graduation, Bullock joined Reeves Instrument Corporation on 91st street in Manhattan as a mathematician working under Paul Brock who had been an instructor at Hunter College before joining Reeves in 1948 where he headed up the Mathematics Group of Project Cyclone. At Reeves, the math group utilized the IBM SSEC in the lobby of the IBM World headquarters and the newly developed IBM CPC to check results of the REAC analog computers. Brock reconnoitered the emerging digital computer battlefield for Reeves in the early 1950s. After completing his PhD at NYU in 1952, he left Reeves and hired on with the CEC computer division in August of 1952. A few months later, he hired Gloria Bullock into his newly formed Mathematics Group in Pasadena. She soon bought a 3-bedroom house not far from the Foothills Freeway and moved her mother out to California. To have written the very first program for the Datatron is perhaps as big a thrill as a mathematician can have in the computer field. Gloria Bullock can claim this honor. Among her first duties in the young company was the teaching of all initial programming and coding courses., Later she organized the Education department that she developed from a core of four people to 32 staff members in six months. This picture comes from the CEC publication, Recordings, of July, 1954 which described the 80 hour coding class for the Datatron. There were two classes a month conducted for customer employees. 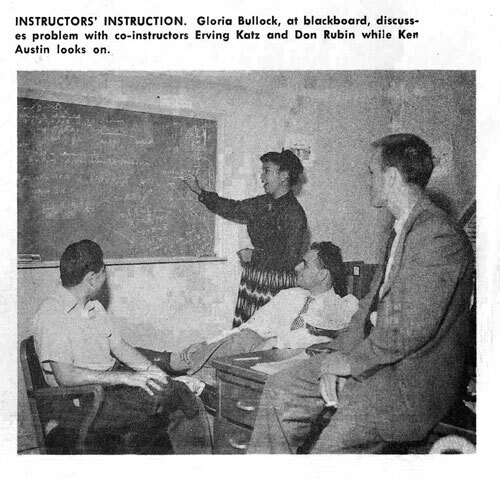 For many early programmers, Gloria Bullock was their primary introduction to computing. In the late 1950s, Bullock became a member of the Burroughs Product Planning department. It was in Product Planning that she became acquainted with Allstate's computer operation and left Burroughs in the late 1960s, moving north to Menlo Park where Allstate had a research facility. While at Allstate, Bullock was featured in a recruiting advertisement published in Ebony magazine. Gloria Bullock passed away this past September. An obituary published in the Sunnyvale Sun can be found here.